Excellent! Absolutely brilliant! 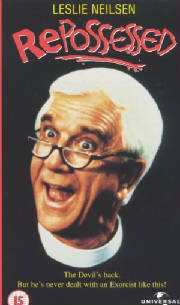 it's very very funny, lotsa Linda, Leslie Neilson, and a catchy theme! All the ingredients for a hit comedy! hehe. A few years have passed since young housewife Nancy's (Linda) exorcism, and everything seems perfect, until! The devil comes out of her T.V set and repossesses her! At which point Nancy turns to a young priest, who must convince the retired Father Mayii (leslie neilson) to return to his post and re-exorcise (is that a word?) Nancy, before the devil takes over the world!